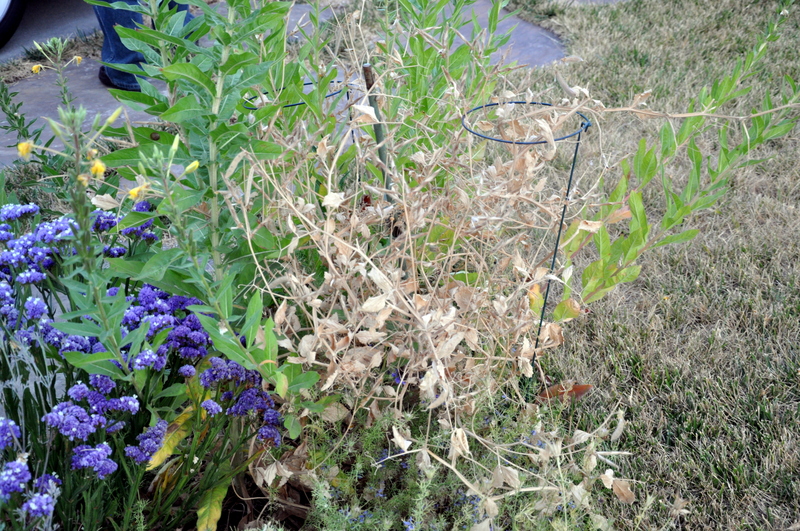 This entry was posted in Gardening and tagged california drought, california gardening, gardening in a drought, gardening in san jose, replacing lawn, self seeded tomatoes. Bookmark the permalink. I SO relate! Except for the couple of years in the desert and now in Chico, I’ve lived my entire life on the coasts. I need a better summer attitude, too. Good luck, Sheryl. I know it isn’t easy. At least a few things are hanging on. I would hate to live in such dry conditions… here in west Wales water is not something we are usually short of, although it hasn’t rained much recently and some of the leaves are falling from my willows even this early in the season. I hope that you get some relief from the drought soon, but I can’t help thinking that California is just not a sensible place for large numbers of people to live in any more. You know you’ve hit part of the problem straight on the proverbial nail. As our population swells and the water available decreases, something has to give. We have many problems that need to be addressed. 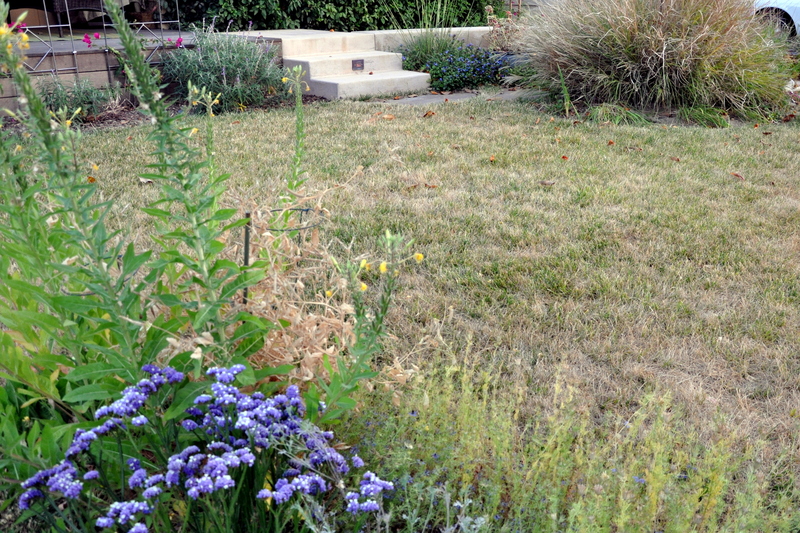 Urban lawns must go. Not just our lawn, but the lawns surrounding industrial parks, wealthy neighborhoods, etc. I read an article with the gentlemen complaining that the park like setting on his thousand acres dwelling was ‘always’ that way, so that it needed to remain that way. That kind of thinking always gets us in trouble. Some places are using reclaimed water (hurray) and others have gone native. As a state, California must rethink our crops and our industry in general. It takes an extraordinary amount of water to raise cattle. I’m wearing my vegetarian diet proudly in this drought, knowing that eating lower on the food chain is also making a difference in water use overall. I’ve never been to Wales and hope to visit one day. My husband has been, many years ago with a girlfriend. Hopefully one day we’ll get there together. 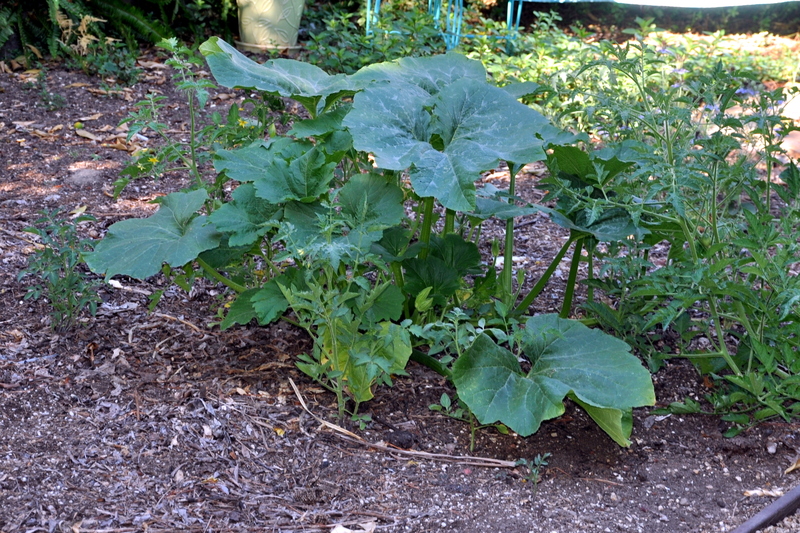 I am amazed at the tenacity of those tomatoes and pumpkins – you must tell us what the fruit tastes like when you have bitten in ….. can these volunteer, water deprived plants really provide plump juicy tomatoes? An inquisitive reader must know! Sweet peas, being a cottage garden plant, thereby proving their reliance on a goodly amount of rainfall or watering, are of course not going to survive very long – sadly. It seems cactus and succulents are just the thing for you now, or until the climate changes again 🙂 And I don’t suppose we will live to see that pendulum swing by. You are so right, Pauline. I was settling in for a summer of lovely blooming sweet peas when the first heat wave hit and that was the end of them. At least I know that I can get a long spring of flowers from the plant with little effort, so I will look forward to that next year. The love-in-a-mist are already setting seed as well. They too volunteered all over the garden. The one volunteer that is going like gangbusters is the yellow Four-o-clock plant. Several of them grew to about a foot, then stopped, but then along came a second crop and they’re three times the height. What a variance! As for the tomatoes, the first one or two I tried lacked flavor so that may be true of the rest. If so, Mike will use them in salsa. I’m still hoping for a few juicy, sweet, salad-makers though. Those tomatoes give me hope. Soon they’ll give me a salad, too. Win-win! These photos of your yard are so hard to see. You Californians are really enduring a hellish stretch–I can’t imagine. We’ve had a long, cool, damp June in the Northeast and, when I think about complaining, I remember what other are dealing with. Complain away! I just did, and I *know* others have it far worse. There are communities here that no longer have water flowing from their tap. Shallower wells have run dry, and big business farmers have the cash to drill deeper so have made the problem for these other communities worse. One woman interviewed drives to another community to take a shower and water now comes from trucks. In some places the ground is depressed because of the over reliance on ground water. It’s a sea change for sure. We don’t usually get humidity, but this summer we’ve received the remnants of off-shore typhoons so have had the humidity as well. That said, it is nothing like the south so I feel for you. I was in Hawaii 25 years ago in September, and the heat and moisture sat on you like a blanket. Best of luck to you making it through the summer as well. All is not lost the tomatoes are looking beautiful, the weather can be so unpredictable at times and it is one thing we can never have control over.Lets us hope that it is not going toget worse for you. In the mean time enjoy your tomatoes. Thank you for that ray of sunshine. Those tomatoes are a gift of hope and resilience. I can relate to the 70s girl in you Alys, as I would also prefer cooler summers. It’s really hot here too right now, but the watering situation you are facing makes me so sad – nurturing a garden is the whole joy of a garden after all. But if those tomatoes can make it despite the odds then there is hope yet, I am sure! You will slowly find plants you can grow with minimum irrigation – beautiful grasses, sedums, and hopefully lots more. I do hope your designer doesn’t keep you waiting much longer to seal those plans you have. Thank you for your support, Cathy. We reached triple digits today and more of the same tomorrow. American Independence Day is Saturday, so I hope it breaks by then or we’ll have all sorts of folks suffering from heat stroke. We’ve had two power outages since the weekend, but fortunately the power remained on today. Does your heat also come in waves or will it remain hot for some time? When I lived in Ontario, Canada as a girl, we would have extreme heat, followed by thunder showers. Here we almost never get showers. I really enjoy all your flowering vase posts, and the beauty you pull together. I used to just plant here and there and follow my own design, but the requirements for landscape replacement are so restrictive that it was easier to hire out a plan. I think the problem is that its a very small project. Ugh! That’s miserable. Thanks for the holiday wishes. We’re staying close to home and hoping the illegal fireworks that sound off all over the neighborhood are short lived. Our cats are terrified each year. I hope we are both back to gardening soon, Cathy. We just had 2 inches of rain on Saturday. That doesn’t count all the other rain. And I know some folks in Illinois who’ve had 14 inches in the last two weeks. Yep. You read that right. They’d love to give you some. Oh, it looks so sad. I can only encourage you to get succulents that flower. It’s such a surprise to see that color when it comes. Kudos to the tenacity of the tomatoes and the pumpkin! Wow…14 inches in such a short amount of time. Did they have flooding? And you got two inches in June! Is that common for Arlington? Yes, hurray for the tomatoes and pumpkin. I’ll let you know if they deliver on flavor. They’re beautiful in color. Arlington in June is usually more thunderstorms than steady rain. As for IL, I’ve only seen pictures of water pooling everywhere and mud. Can’t imagine creeks aren’t out of their banks, but haven’t heard of anything like a folded town. Thunderstorms are rare here, too. I’ve always found them fascinating. We get them in Northern California in the summer, and unfortunately they are often responsible for forest fires. 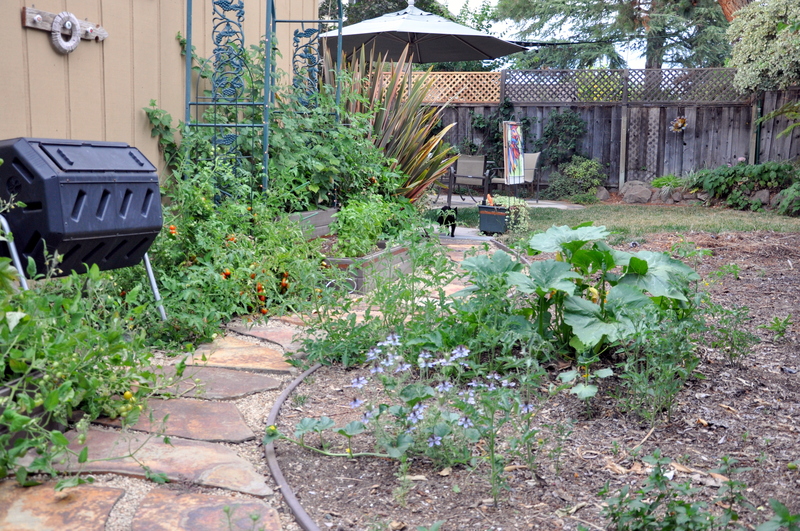 Do you water your garden at all, then or is there enough rain to take care of the job? I water every other day if it’s hot and we haven’t had rain. But if there’s a good rain each week, I let it go. Plants mostly need about an inch and a half of water a week. We average 4 inches in June (but got 12 last month). It’s unusually wet this year. And cool. Wow that’s a lot of rain. I had heard it was wet in a lot of places this summer, but didn’t realize you had so much in June. It would be nice if you could capture all that rain in a tank under your garden, then bring it up with a pump when needed. I’ve looked into catchment systems here, but with so little rain these past four years, its been hard to justify the financial investment. Lots of people have rain barrels and gardens planted to slow and clean run off. Because what doesn’t soak in runs off into creeks, rivers and bays. Our problem out here is dirty run off going back into the ecosystem. Dirty run off, meaning toxic from street oil and that sort of thing? I figured as much. Yet another great reason to be getting rid of our own lawn. We’ll get our earth back in order, I’m convinced of it. One healthy garden at a time. And yes to the succulents that flower. I am with you in terms of the 70s. I have wanted to live over the hill all along but Buddy never wanted to make the commute so here we still are. I need to work on having a better summer attitude as well. I hope some of your tomatoes end up tasty for salad-it is pretty amazing that they are growing so well in this weather. (I am not). I hear you, Betsy. I think we’re a lot of like in he heat department. I feel so irritable and uncomfortable and then I feel bad for being so irritable. It would be nice to live over the hill, and perhaps when Buddy retires you can head that way. I’m hanging my hat on a cute place in Victoria. Hi Alys. Isn’t nature incredible. Had you planted the pumpkin and tomatoes, then they probably would have sulked and died. But here they are all by themselves and look to be flourishing. I hate to think what I would do without water and without gardening, I take them both for granted. (Although I do think of you when I’m running the tap longer than need be and turn it off feeling a little guilty) It must be so trying, especially when you see others in your community not doing what is best for the greater good. I do pray you get rain soon. I almost missed this. I loved how you wrote it. Made me smile. I’m a 60’s girl. By 70’s I’m starting to fade a bit. We’ve had nothing but mid to high 90’s for the entire month of June. I’m barely moving or thinking. I happened to notice on my Facebook page my hometown had posted a graph chart of their temps. They are floored by high 90’s too. In Germany! That’s the up north part not the Bavaria part in the south. It’s so unusual for them. We could barely find a fan when we were there in August many years ago, as they never needed any cooling. I hope you get your landscape plan soon. I used to work for a landscape architect who lied to every client that he was done and on the way, stuck in traffic when he was actually still sitting at the drawing table. Then I had to call and say he couldn’t get there. I hated that part of the job and not fond of him. What is it with some people? I’m outside at 5-5:30 in the a.m. Too hot here at night. But we will cope won’t we. There are no other options. Oh dear. I can’t imagine how walking thru your once green garden is affecting your mood. Of course it would hon and no appology is needed at all. We’ve really mucked up our poor Earth haven’t we? Scientists have been warning us about this for at least a decade, yet very little has changed. As I read thru every single message here, it’s obvious the temperature is up all over the globe. We normally have a lot of rain in June but this year it’s been a lot less. We get a couple of rainy days followed by more days of unseasonable hot weather. Seems we can’t keep up. As I type this, Jim’s watching ‘This Old House’. They are standing on the bed of Lake Mead and it’s over 150 ft down from where it should be. I don’t know how it will recover in our lifetime. They are showing a ‘water smart’ yard that looks so nice. So it’s absolutely possible and can be a reality for you too. Maybe you can consider working with a new landscaper who can address your plan in a timely manor?